The shooting Wednesday of House Majority Whip Steve Scalise and four others was a shock to the nation. But to an extent, it was also the latest -- and by far the most violent -- manifestation of hostility in American politics. The suspect was a Bernie Sanders supporter with deep anti-Trump views. Lawmakers said afterward that hateful rhetoric has been on the rise on both sides, and needs to cool. Former House Speaker Newt Gingrich said Wednesday that in the age of Trump, it is particularly pronounced on the left: "The intensity on the left is very real," he told Fox News. Weaver dropped out of the congressional race against Rep. Steve King, R-Iowa. "Beginning during my 2016 campaign, I have received very alarming acts of intimidation, including death threats," she said in a Facebook post. "While some may say enduring threats are just a part of running for office, my personal safety has increasingly become a concern." Weaver also wrote about other concerns, among them that her mother "has been experiencing ongoing health issues." 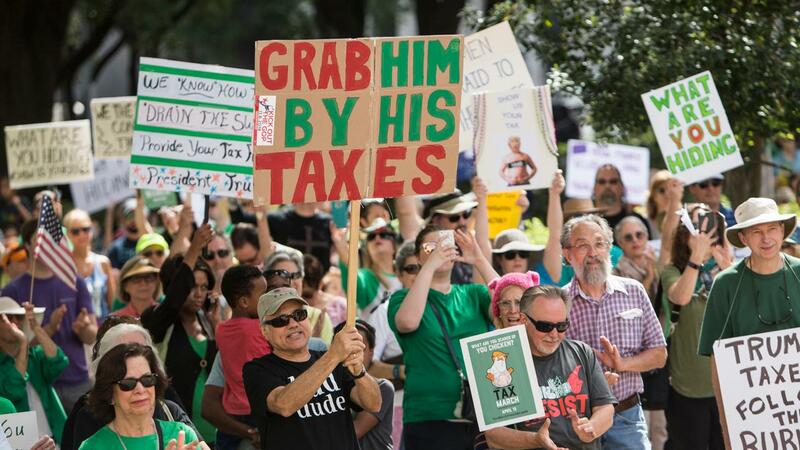 Green played recordings of threatening messages he got after calling for President Donald Trump&apos;s impeachment, according to the Houston Chronicle. "You ain&apos;t going to impeach nobody," someone said in a recording. "Try it and we will lynch all of you." "You cannot allow hate to be hidden. You have to expose hate. Hate is a means by which people can be harmed," Green said. "It&apos;s an evil. The best way to deal with evil is to expose." The politician faced town hall attendees upset that a bill to repeal Obamacare repeal passed in the House. "You have been the single greatest threat to my family in the entire world," attendee Geoff Ginter told MacArthur. "You are the reason I stay up at night. You are the reason that I can&apos;t sleep." The New Jersey congressman was also labelled a "liar" by people at the town hall. The lawmaker, a backer of the American Health Care Act (AHCA), was booed during the event, according to The Post-Journal. "Repeal and Replace Tom Reed," read one sign. Labrador was loudly booed after saying that no one dies because of not having health care. A woman told Labrador that he was "mandating people on Medicaid accept dying." "No one wants anybody to die," the lawmaker said. "You know, that line is so indefensible. Nobody dies because they don&apos;t have access to health care." "In a lengthy exchange with a constituent, I explained to her that Obamacare has failed the vast majority of Americans," Labrador later said in a Facebook statement. "In the five-second clip that the media is focusing on, I was trying to explain that all hospitals are required by law to treat patients in need of emergency care regardless of their ability to pay and that the Republican plan does not change that." Police made more than 40 arrests in the U.S., when tens of thousands of people protested some of Trump&apos;s policies. People came out to protest Coulter&apos;s canceled appearance at the University of California-Berkeley. Six people were arrested — one for obstructing an officer and wearing a mask to evade police, and another for possessing a knife, police said. Tom Perez, the new chairman of the Democratic National Committee (DNC), had his name booed during a stop on a unity tour with Sen. Bernie Sanders (I-VT). Claire Cummings with the Maine Young Democrats spoke about why attendees may have come to the event. "Maybe it&apos;s because you love a certain senator from Vermont," she offered. There were cheers, followed by chanting of "Bernie." "Maybe you came through because you are curious about the new DNC chairman and the future of the Democratic -" she later said. There was booing and cheering. The Democratic senator was the subject of boos at a town hall event, where the majority of the crowd apparently supported her, the Mercury News reported. Booing took place when she said she "was not there" on single-payer healthcare and she didn&apos;t oppose the president&apos;s missile strikes on Syria, the report said. "You’re pretty good at yelling… You can sit here and pound your fists and I can show you what I’ve gotten done," she told protesters at one point during the event. Police made at least 20 arrests in the California city. Trump supporters had announced plans to hold a "Patriot Day" event at noon that would feature speeches by members of the alt-right. Counter-demonstrators followed that by announcing plans for a 10 a.m. rally at the same place. Officials put up a makeshift barrier of plastic orange poles and orange fence mesh to separate the sides, but that came down after demonstrators began punching and kicking each other, while pepper spray and firecrackers were thrown into the crowd. More than 1,000 people booed Stewart at a town hall as he defended GOP positions on health care, public lands and immigration. Audience members yelled, "Do your job," imploring him to investigate and denounce alleged connections between President Donald Trump&apos;s campaign and Russia and to hold the new administration accountable. Stewart started the event at a high school by acknowledging that many in the crowd likely didn&apos;t vote for him, but he said he thinks it&apos;s still important to hear them — one of the few comments he made that received applause. 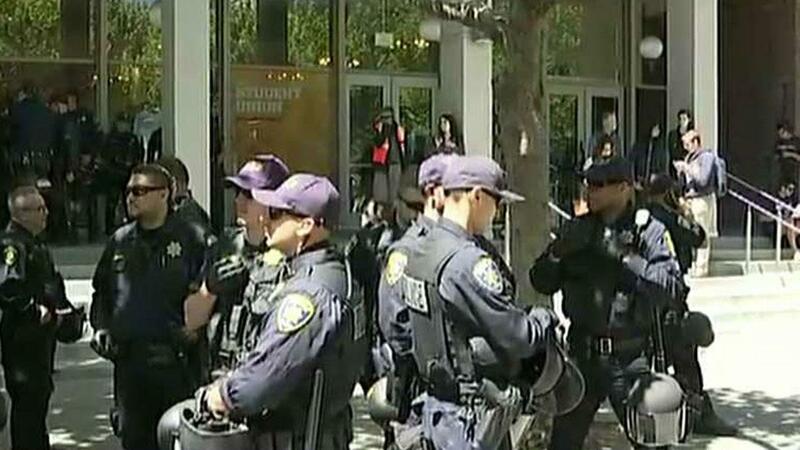 "March 4 Trump" rallies supporting the president were held in parts of the U.S. Berkeley police said 10 people were arrested after Trump supporters and counter-protesters clashed during a rally that turned violent and left seven people injured. None of the injured were hospitalized. Elsewhere, there were arrests in St. Paul, Minn., Olympia, Wash., and in Nashville. "Hundreds" of people demanded Reichert have town hall meetings, which the congressman said he stopped following the shooting of Rep. Gabby Giffords, Q13 Fox reported. Protesters, however, demanded for Reichert to "come on out." Ross was booed at the event, where people held signs reading "Boo" and "Disagree," according to the AP. Webster faced a rough reception at a meet-and-greet, where he was reportedly heckled. "This office is open to everybody here, and we will help you in any way possible," he said, before leaving to boos, the AP said. He didn&apos;t take questions. Protesters held signs outside the event. McConnell "brushed aside" some questions at the luncheon, the Courier-Journal reported. He also received some boos on his way out. Several other GOP politicians also had events that day where they dealt with jeering crowds. More than 100 people came out for the Land O&apos;Lakes event, in which plans to repeal and replace Obamacare were discussed, Fox 13 reported, which described the crowd as "heated." Bilirakis earlier faced angry constituents at a February 4 town hall. Chaffetz was met by frequent, deafening boos at a town hall as constituents grilled him on everything from investigating President Trump&apos;s tax returns to Planned Parenthood. He repeatedly said, "hold on," and "give me a second," as the audience members reacted negatively to nearly all of his statements. Hundreds of people stood outside the auditorium holding signs and chanting, "Vote him out," while one woman was arrested. McClintock was constantly interrupted and booed as he defended the Republican Party’s national agenda during the event at a theater. Hundreds of protesters stood outside chanting "Vote him out," while those inside the theater held signs that read "Resist," "Dump Tom McTrump," and "Climate change is real." McClintock had to be escorted by police after his hour-long event. Protesters followed him, shouting "Shame on you!" Protesters came out to oppose a scheduled talk by McInnes, a conservative comedian, at the school in New York City. 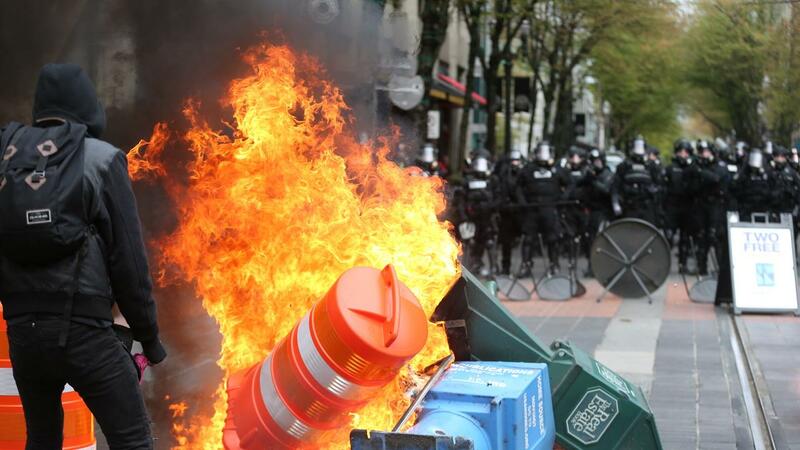 Protesters clashed with both law enforcement and McInnes&apos;s supporters, according to Reuters. Yiannopoulous, then a Breitbart News editor, was supposed to speak at the university. However, more than 1,500 protesters showed up outside where the talk was going to happen, prompting it to be cancelled by the school. 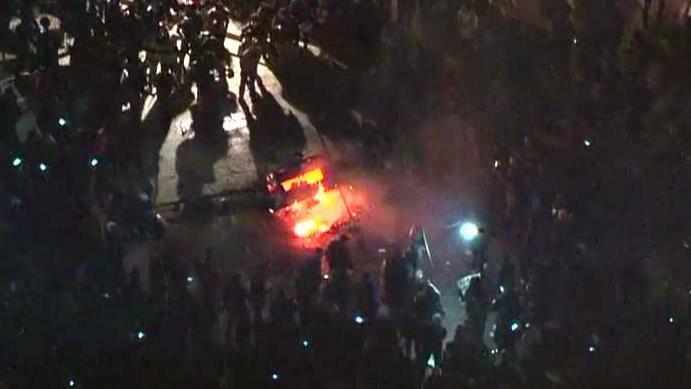 A small group broke windows, hurled smoke bombs and flares, and started a bonfire. "This was a group of agitators who were masked up, throwing rocks, commercial grade fireworks and Molotov cocktails at officers," UC Berkeley Police Chief Margo Bennet said. Speeches by the two men were canceled after heated protests erupted at the California school. What about entertainment and celebrity rhetoric? Pop culture hasn&apos;t been safe from controversy either. 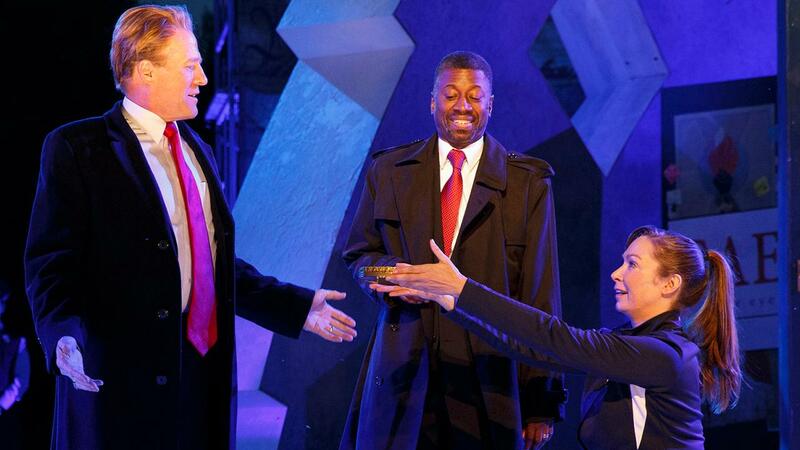 A current Shakespeare in the Park production of "Julius Caesar," in which a Trump-esque Caesar is brutally stabbed, prompted outrage and the loss of sponsorships from Delta and Bank of America. The Public Theater is standing by the production. Comedian Kathy Griffin also recently made waves for a photo which appeared to show her holding the bloody, decapitated head of the president. She apologized late last month. In March, rapper Snoop Dogg made waves for a music video in which he shot a clown that looked like the president. While at the women&apos;s march in Washington in January, pop star Madonna also commented, "Yes, I have thought an awful lot about blowing up the White House. But I know that this won&apos;t change anything." She later said in an Instagram post that she "spoke in metaphor." During the 2016 election, a video filmed for a voting campaign emerged, in which actor Robert De Niro said he wanted to punch Trump. "He talks how he&apos;d like to punch people in the face?" De Niro said in the clip. "Well, I&apos;d like to punch him in the face." De Niro later doubled down on his remarks in a February appearance on The View.